The ST1000 is Ingersoll-Rand’s premier large frame starter designed for big engines up 320L. Developed in the early 2000’s, the ST1000 combines the proven drive and gear reduction of the ST700/900 series with a redesigned, state-of-the-art motor assembly in order to provide the most reliable starting performance in the industry. Starting reliability equates to the customer being able to start every time, on demand. 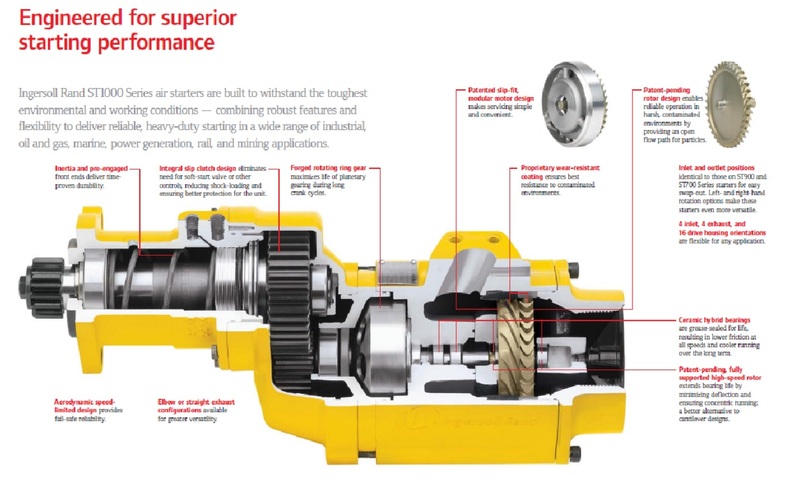 Cardinal Valley’s experience and our customer’s experience is that this series is the best bet to achieving a level of reliability that ensures our customers are regularly making profit rather than dealing with losses due to engine downtime. In multiple applications, Cardinal Valley has seen these starters, when properly installed with a properly calibrated air start system, starting the same application for 5+ years without a single starter mechanical failure. With a variety of different models and gear ratios, the ST1000 Series starter is suited to multiple different engine types from diesel to natural gas engines, as well as applications across a wide array of industries to include marine (workboat and fishing), oil and gas, and power generation.